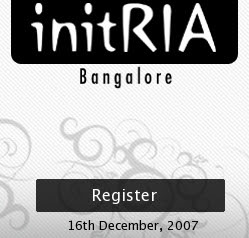 "initRIA is the first of its kind Rich Internet Applications developer conference in India. I, along with some other members of the Bangalore Flex User Group, am organizing this conference with the hope of providing a platform for RIA enthusiasts around the country to interact and learn. You can know more about the conference at our FAQs page." , says organizer Mrinal Wadhwa. At the time of writing this post, there is just 1 more seat left! If you are in Bangalore area, and haven't registered yet, GO REGISTER! Just wanted to let you know about this first of its kind develeoper event in India - The Great Indian Developer Summit, scheduled for May 2008. There is an exclusive Rich Web conference as part of it. Do check www.developersummit.com for details or write to me - shibu@endtoendmarketing.net.